“Just do it” is 30 years old this year. That’s a long life for a slogan, many of which are lucky to last a few months. Coca-Cola averages a new slogan about every two years. But for three decades, “Just do it” has been an elegantly concise, three-word philosophy that simply asserts that action is better than inaction. And frankly, after all this time, it also means that if you haven’t done it by now, you’re probably not going to do it. This timeless tagline is equal parts encouraging and scolding its readers, saying, “Go ahead, walk a mile, run a marathon, ask that person out, start a business. Do whatever it is you want to do, but get up off the couch and just do it.” Naturally, the implication is if you want to wear Nike shoes while you’re doing it, so much the better. When Nike introduced the tagline in 1988, they already had a decent market share of about 18 percent of the running shoe market. In the next ten years, that share rose to 43 percent as recognition of the Nike brand name, the iconic swoosh and soon-to-be-classic tagline grew. It has been estimated that 80 percent of Nike shoes are not worn for the purpose they are designed for (running, tennis, basketball, etc.). So, what drives consumers to pay the premium price for running shoes that they never run in? For starters, it’s one of the fundamentals of branding: self-esteem. People who buy Nike products feel better about themselves for doing it. Lace up a pair of Nikes and you’ve taken the first step toward some kind of action, even if it’s walking to the garage to get in your car and go to the grocery store. Most Nike buyers know they’re never going to be elite athletes, but wearing their shoes at least says they’re making some kind of an effort to be active and healthy. The origin of this three-syllable, eight-letter gem is interesting. The writer of the slogan, Dan Wieden of the Wieden + Kennedy ad agency, says he paraphrased the line from the last words of convicted killer Gary Gilmore, who reportedly said, “Let’s do it,” just before his execution. Of course, “Just do it!” is also a phrase uttered by many an exasperated parent or boss, as well. 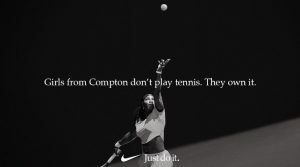 In 1999, Advertising Age named “Just do it” the second-best tagline of the 20th century, behind the DeBeers slogan, “A diamond is forever” (when the Nike slogan was just 12 years old at the time). Even at age 30, it has a long way to go to catch some other classics such as BMW’s “Ultimate Driving Machine,” now 43, and Wheaties’ “Breakfast of Champions,” which is an incredible 85 years old.